In this photo provided by the UK Parliament, Britain's Prime Minister Theresa May addresses MP's in the Palace of Westminster in London, Wednesday, April 3, 2019. 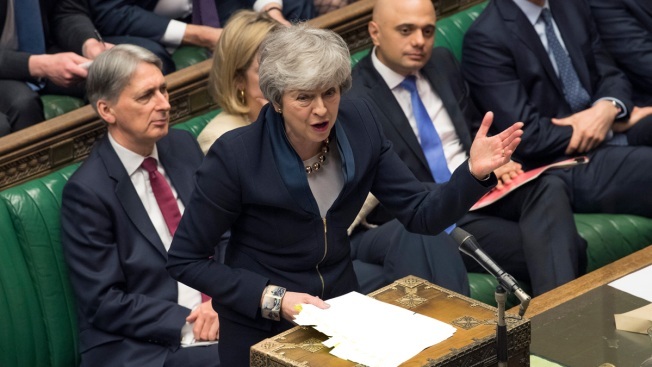 British Prime Minister Theresa May on Friday again sought to delay Brexit until June 30 to avoid a chaotic withdrawal from the European Union in one week, although a key leader of the bloc suggested an even longer pause in the difficult divorce proceedings. The question over timing is vital because Britain is set to leave the EU without a withdrawal deal in place on April 12 unless an agreement is reached at a Brussels summit set to take place two days earlier. In a letter to European Council President Donald Tusk, May asked for an extension until the end of June and agreed to make contingency plans to take part in European Parliament elections on May 23-26 if necessary. An earlier British request for a delay until June 30 was rejected last month, amid rising irritation from EU leaders about the political chaos in London. There also have been increasing fears that the longer the U.K. stays, the more it will obstruct EU policies and plans. Tusk proposed a longer time frame Friday and he urged the 27 remaining EU nations to offer the U.K. a flexible extension of up to a year to make sure the nation doesn't leave the bloc in a chaotic way that could undermine commerce and hurt many EU nations. Two EU officials said Tusk wants a one-year period, which has been dubbed a "flextension," and hopes to get it approved at the EU summit on April 10. The officials spoke on condition of anonymity because they weren't authorized to disclose information before it was made public. Such a move would mean that the U.K. would need to take part in the elections to the European Parliament, something May has long argued would not be in either side's interest. The elections pose a substantial stumbling block because Britain would be expected to take part, if it is still an EU member, so its people have representation in the European Parliament. Officials worry that the legitimacy of European institutions could be jeopardized if the population of a member state is not involved in the process. EU nations already have watched nearly three years of political anxiety over Brexit. French President Emmanuel Macron has thus far seemed cagey about giving Britain more time, saying the bloc cannot be held hostage by Britain's political deadlock over Brexit. There are also concerns in Europe that some British politicians who want to provoke a "no-deal" Brexit might try to make trouble from inside the bloc, a course that outspoken Brexit advocate Jacob Rees-Mogg suggested Friday. He tweeted that "if a long extension leaves us stuck in the EU, we should be as difficult as possible." The Conservative Party lawmaker suggested using Britain's positon to veto any EU budget increases, block the establishment of an EU army, and make it impossible for Macron to push further EU integration. One EU diplomat said that there was rising concern among member states that they would not get "sincere cooperation" from Britain, which could hurt how the bloc functions. "There are important decisions to be taken after EU elections," said the official, who spoke on condition of anonymity to comment on closed-door meetings preparing for next week's summit. There also were fears about a chaotic Brexit on April 12. The U.K. is scheduled to leave the E.U. next March. There are concerns that such an abrupt exit without a deal could lead to economic slowdown and a breakdown in food and medical supplies as border checks and tariffs are added overnight. Massive traffic jams could also be expected on highways leading to major ferry ports. The complex maneuvering on dates comes as Britain's Parliament considers legislation designed to prevent such a "no-deal" departure. Britain's upper House of Lords is set to resume debate on the measure Monday. It was endorsed earlier by the lower House of Commons by just one vote. 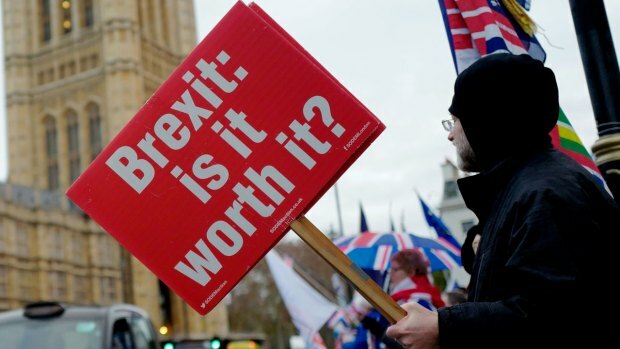 Despite the apparent support in Parliament for a new law to prevent a no-deal exit, the decision is in the hands of the EU, not Britain. It is the first country to try to leave the bloc, and the formal "Article 50" exit procedure has never been tested before. All 27 nations have to agree unanimously on an extension. The Europeans would prefer that Britain not take part in the European Parliament elections if it is going to leave. April 12 is the last day for Britain to signal whether it will field candidates. 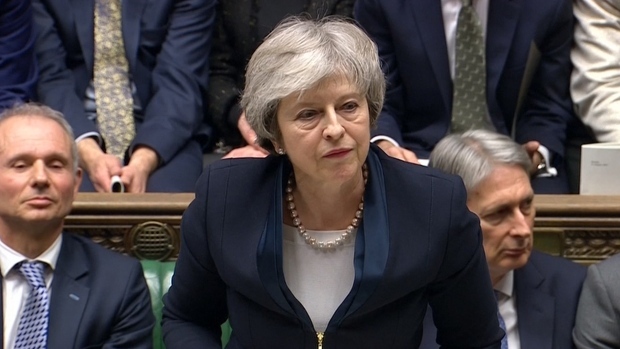 May said in her letter that Britain is reluctantly ready to begin preparations for the European elections if no Brexit deal is reached in the interim. She said she is making the preparations even though she believes it is not in the interest of either Britain or the EU for her country to participate because it is leaving the bloc. 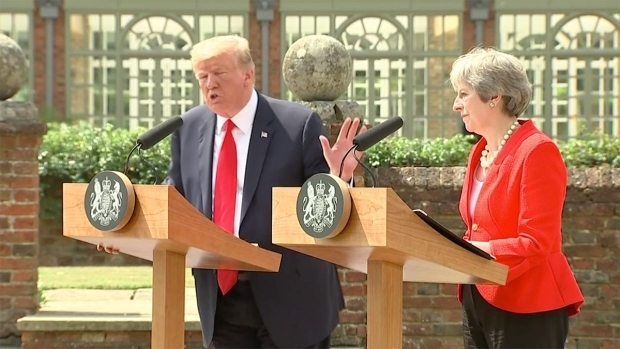 President Donald Trump is asserting that he didn't criticize British Prime Minister Theresa May during an interview this week with The Sun newspaper in which he questioned May's handling of the Brexit. May's withdrawal plan, reached with the EU over more than two years of negotiations, has been rejected by the U.K. Parliament three times. 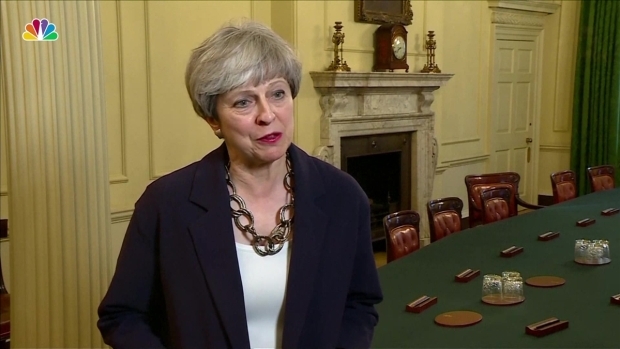 She is now seeking a compromise in a series of talks with Labour Party leader Jeremy Corbyn and his deputies, with hopes of winning opposition support for a new divorce deal. The talks do not seem to be advancing. The Labour Party said in a statement Friday it is "disappointed" that May's team is not offering real change. "We do need change if we're going to compromise," said Keir Starmer, the party's Brexit spokesman, Keir Starmer, said, adding that Labour wants the talks to continue. If the talks don't work, May plans a series of votes in Parliament to see if a majority-backed plan can emerge. Ideas being discussed include keeping Britain in a customs union with the EU after it leaves the bloc, as well as the possibility of a second referendum. There is fierce opposition from Brexit backers in the Conservative Party to these options. Embattled British Prime Minister Theresa May appointed ministers to her shaky government Sunday, June 11, 2017, as some Conservative colleagues rallied to support her. Others said her days were numbered after last week's disastrous election. Associated Press writer Lorne Cook contributed.